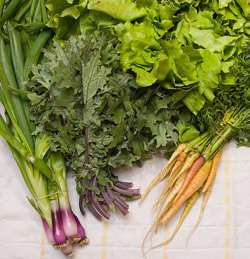 As the locavore movement gains momentum, the opposition gets louder. Every few months or so, an article comes out that supposes that eating locally is a dogmatic practice based solely on a simple equation. People eat local food, such articles proclaim, simply because they think that cutting down on food miles is energy efficient. And while it’s becoming increasingly clear that the issue of energy use in the food system is infinitely complex, this core idea – that eating locally is about math – is simplifying, dismissive, and counterproductive. The latest such article is “Math Lessons for Locavores,” by Stephen Budiansky in the New York Times. And ― perhaps more noteworthy than the article itself ― the wave of responses (published in a coordinated effort on Grist.org) is enough to get any fledgling local food lover fired up. As these perspectives imply, there are many thoughtful ways to respond to questions like, “Isn’t this whole local food thing just hype?” What follows are excerpts; read the complete collection of articles here: Food fight: Do locavores really need math lessons? At its heart, the movement is about relationships. When you buy food at the store, your purchasing decision rests mainly on marketing claims. But when I pick up my weekly box of produce from Farmer Phil, I know exactly how and where he grew my food, and that his values are consistent with mine. I have noticed that oil supplies are peaking. In 20 years, I have no reason to assume that this massive fossil-fuel-based system will be able to find the oil it needs to bring foods to local stores, let alone whether I will be able to afford the price of that energy. I want to bring those sources of uncertainty a little closer to home, where I can see them. When I am tasting my breakfast of scrambled local eggs with the first good tomatoes of the season, I’m not really doing any math whatsoever ― I’m thinking of the farmers and the well-treated workers, and of the amazing flavor of my meal. When we ask folks to eat locally, we are asking them to eat whole foods that are rarely processed. If the only thing that encouraging eating locally accomplished was getting people to eat more whole, real food, and less processed non-food, we would be taking large strides toward getting our nation healthier. What does it mean when so few companies control so much of our food? It means that unless we happen to live in a place with a lot of local farmers and the infrastructure to process and distribute their products, we have virtually no control over what we’re eating or feeding to our kids. If these companies choose to raise meat using hormones and antibiotics (and they do), or grow corn from genetically-modified seed (and they do), then that’s what we’ll have access to. And if one thing goes wrong at one of those companies, we all risk being affected. So here’s my message to Mr. Budiansky: The local foods movement is not so much about choosing between what’s grown here and what’s grown elsewhere. It’s about having any sort of choice at all.